John Rhode was a former artillery officer who turned to fiction in the post-war years. After three or four thrillers he started his Dr Priestley series of detective stories in 1925 with The Paddington Mystery. Collins are making something of Rhode by re-printing him as a Crime Classic, but during his lifetime he was less regarded by the literary community. His readers however seem to have been enthused with his work at the time. The Paddington Mystery was published in October 1925 and was so popular that it was re-printed that same month and then again in January 1926. The story is quite simple: wastrel Harold Merefield returns home from a drunken night to find a corpse in his bed. 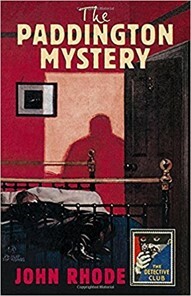 After a week of police interrogations Merefield finds his name in society almost completely blackened, for even though an autopsy and inquest have found the mysterious figure died of natural causes, the question of why an unknown man should have appeared in Merefield’s bed has not been answered. Merefield falls back on a friend of his late father, Doctor Lancelot Priestley, for advice. And from this first novel, as he always would be; Dr Priestley is little more than a brain demanding facts not inferences, allowing Harold to go out collecting more and more information. The Paddington Mystery has two interesting features: it is set almost completely in working class, if not slum, areas: the eponymous Paddington (near the canal and the Great West Way), and Camberwell. The distance between the two districts, the troublesome tram rides and long walks once arrived is emphasised. Neither electricity nor gas has reached the streets of houses in either area – candles are necessary for what illumination can be achieved. Later on, when Dr Priestley reveals the truth, the ability to suddenly switch from candle light to the full gleam of electricity is part of his catastrophe: but Dr Priestley and his daughter, and their maid, live in Westbourne Terrace, a very different part of town. The second aspect of interest is politics: Merefield’s landlord, Mr Boost, a second-hand furniture dealer, is a communist, who assumes that Merefield’s choosing to live in Paddington makes him a communist as well. Boost is part of a larger organisation, of which Isaac Samuels, another dealer in Camberwell is a less-trusted member. It is only at this later stage that (despite his name), Samuels is identified as a Jew, but there soon follow references to other characters who are products of mixed-marriages (as was the historic Bela Kun). As events go on it is clear, though without direct reference, that some characters are in sexual relationships yet show no awareness of their partner’s religious background that circumcision (or not) would indicate (the same problem that troubled Dorothy L Sayers in Whose Body? ), or at least they avoid discussing it. This marks The Paddington Mystery, if anything, as a child of its time. Rhode, though, may have been in advance of his peers, thriller writers such as Sapper, in other areas, for he allows that there are good and bad communists. Dr Priestley says of Mr Boost when compared with Isaac Samuels: “In Inspector Hanslet’s own words, he is considered ‘Straight,’ and is a man whose word may be safely accepted”. On a lighter note it is clear that Rhode still had some work to do on his plot and imagery. For example, there are references to men being “safe in taxis” (that exact phrase may not be used, but it was the debs’ term for their dates as late as the 50s), but there are no characters who are not “safe in taxis”: it appears that Rhode did not realise he could not have an unmatched parallelism. His see-saws are only on a large scale: good/bad communists. All that said, if are you considering starting a John Rhode collection (he wrote another series under the pseudonym Miles Burton, with a more active detective); you will find that Inspector Hanslet, only mentioned here, becomes much more prominent, and Harold Merefield becomes Dr Priestley’s secretary, and his eyes and ears in detection. For a long time The Paddington Mystery has been almost impossible to find, with second-hand copies going for four figure sums. Now you can have it, with Tony Medawar’s introduction for under a tenner, I would grab it with both hands.